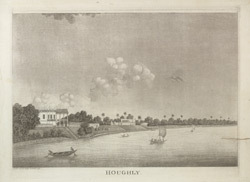 Uncoloured aquatint with etching of the River Hooghly by James Moffat (1775-1815) one of his 'Views along the Hooghly' published in Calcutta in 1798. Calcutta was founded on the mud flats of Hooghly River, a tributary of the Ganges, by the English merchant Job Charnock in 1690. In addition to shipping on the river, private residences were built at the water's edge.